Home to over a dozen peaks over 14,000 feet, and 300 peaks over 13,000 feet, the San Juans, directly out the back door of Mountain Trip HQ in Telluride are undoubtedly the finest range in the state for mountaineering. 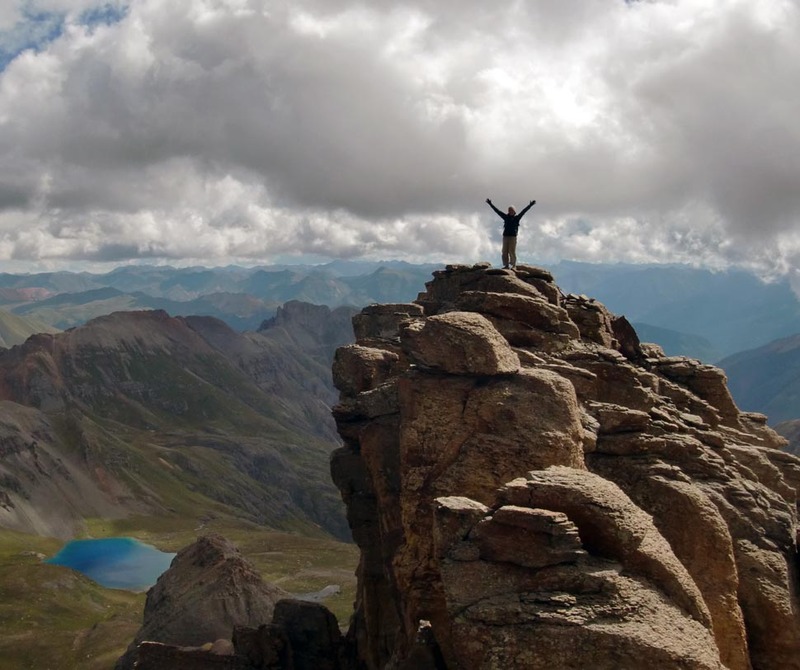 Join us for a foray into the wild or allow us to help you tick off some of your list of 13ers and 14ers! 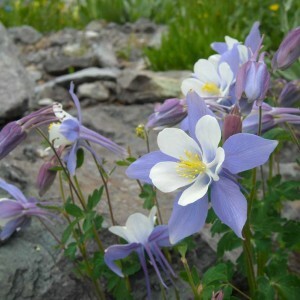 Mountain Trip is permitted by the US Forest Service to guide on the famed Wilson group (Mt. Wilson, Wilson Peak and El Diente). 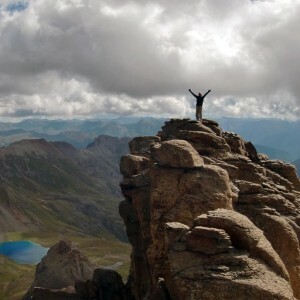 Additionally, we offer trips up a number of the Centennial 13ers, including Dallas, Vermillion and Gladstone Peaks. Also in our backyard is the very challenging Lizard Head Peak, which requires 5th class rock climbing to reach its 13,113′ summit. Peak ascents require, at minimum, a full day’s effort. During the monsoon season we will try to start before sunrise to beat the rain that often falls in the afternoon and to ensure us a good crack at the summit. 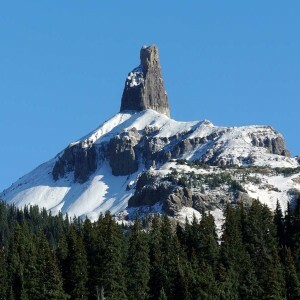 Many of these peaks can be linked together in a longer trip offering a great deal of time in the alpine above timberline with great views of the surrounding areas. 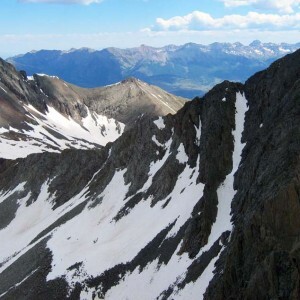 Only 1.5 miles away from neighboring Wilson Peak as the crow flies, lies the tallest summit in the Wilson group – Mount Wilson. It is a bulky mountain with a classic ridge extending west towards El Diente. 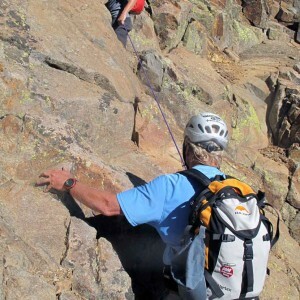 The typical approach is via the Killpacker trailhead, which allows access to both Mount Wilson and El Diente’s normal routes, as well as the classic Wilson – El Diente traverse. An interesting approach is via the less traveled Bilk Creek Basin, climbing up and over a saddle to gain access to the peak. Mount Wilson can be climbed in a day, and although the climbing is never too technical, the endeavor makes for a very, very long day with some loose scrambling and requires an early morning start. 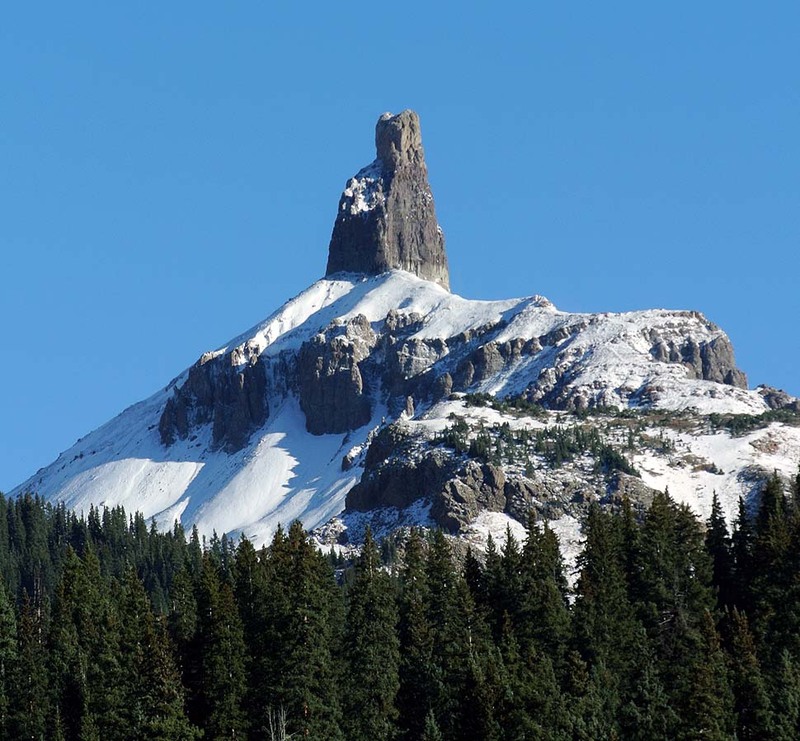 This peak can also be climbed in conjunction with Wilson Peak from Navajo Lakes. If using this approach, one can also make for the “San Juan Trilogy,” of Wilson, Mount Wilson, and El Diente in one epic trip. El Diente is the lowest peak of the Wilson group and only allows access to its summit via some exposed 4th class climbing. 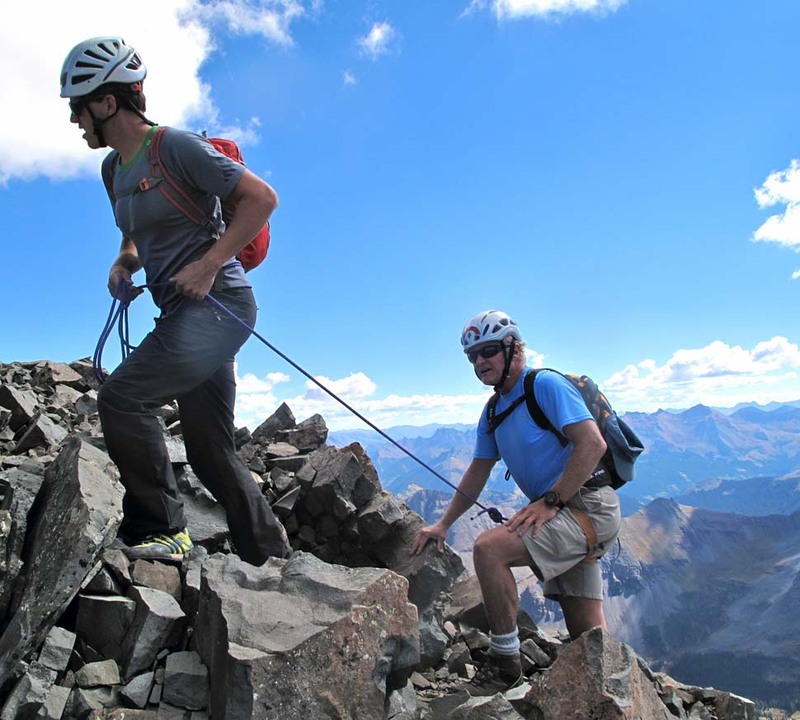 As you climb closer towards the summit, your efforts are rewarded with expansive views of Lizard Head Peak, the Wilsons, and out into the La Sal and Abajo peaks of Utah. This climb can be done in one long day, but generally requires an early start so that we can get off the summit before afternoon weather has a chance to build. 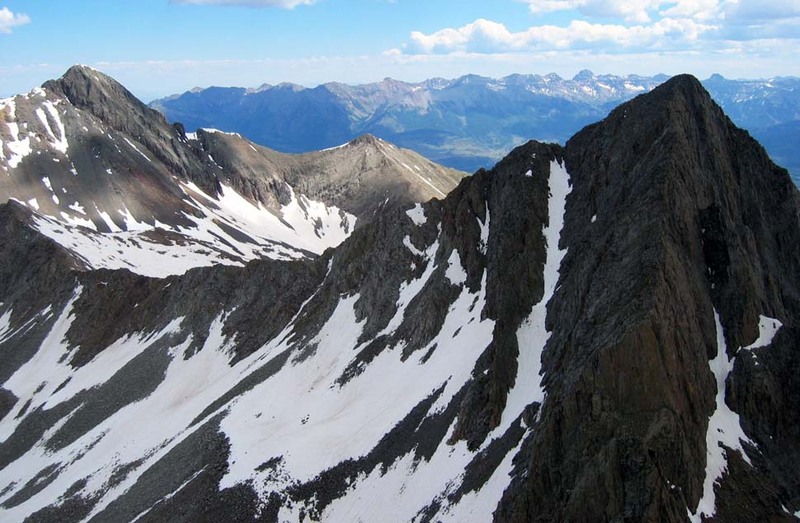 This iconic traverse rewards mountaineers with two classic summits and over a mile of ridge traversing above 13,500′! 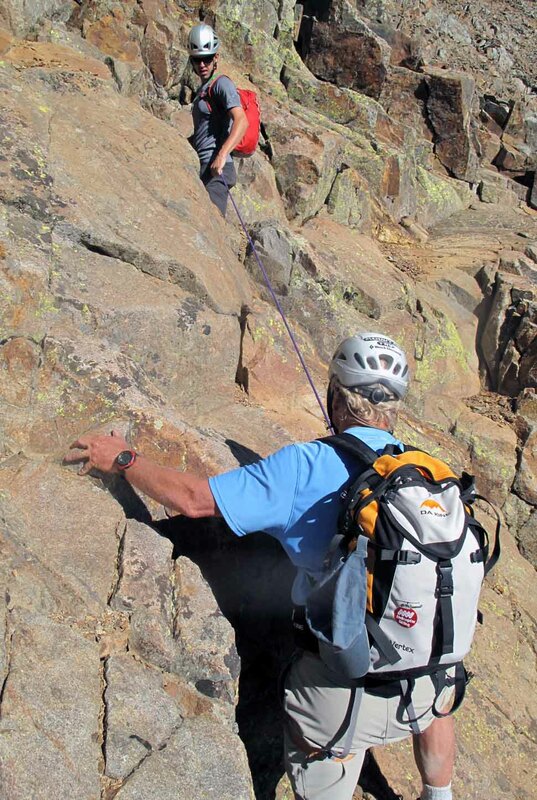 The crux comes at a feature called the Organ Pipes just before hitting your second summit, El Diente. We then descend El Diente and head back into the trees and hike out. This is a very long one-day effort and is often done in 2 days. Either way, we will need to get an early start from camp as most of the day is spent above timber line we will want to beat any afternoon weather. 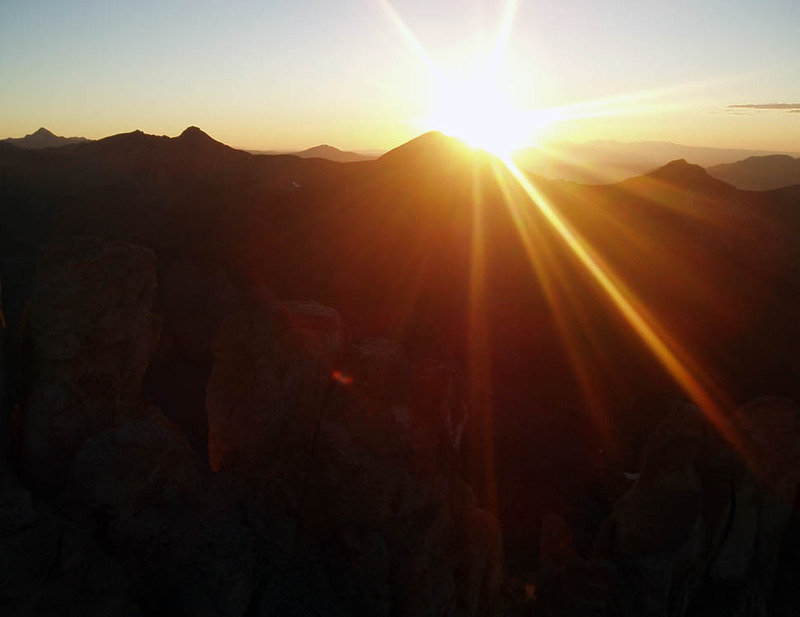 Wilson peak is the highest point in San Miguel County and offers unrivaled views of the surrounding peaks and far out into the Abajo and La Sal ranges of Utah. 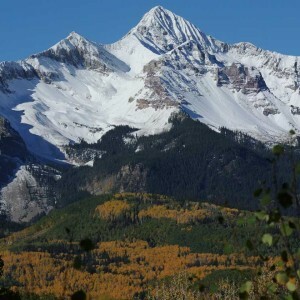 At Mountain Trip our hearts lie in the remote and pristine areas of the world and we are happy to offer a less traveled approach to this iconic Colorado peak via Bilk Creek Basin. This ascent rises just over 4,000 ft from the trailhead making for a full, but manageable, day out in the mountains. We will weave through green meadows after a creek crossing of the flowing Bilk Creek and past many scenic waterfalls. We then follow the creek to its headwaters above timberline below Wilson Peak’s southeast flanks. After scrambling up to just over 13,000ft to join the SW ridge, we’ll head up some exposed 3rd and 4th class terrain to the false summit and then onto the main summit and its amazing 360 degree views. On the decent we will retrace our ascent path back into forest below. 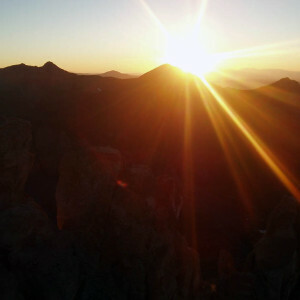 Options – For a classic multi-day trip we can establish a high camp and also climb Mount Wilson and/ or Gladstone Peak. This option offers a remote feel and can be combined with a gorgeous trek ending on Lizard head pass. 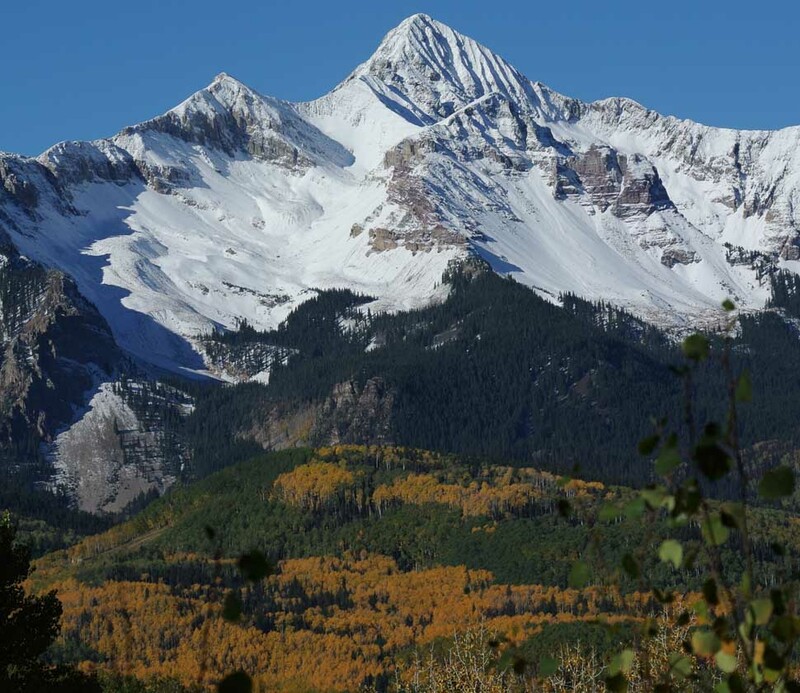 Fun Fact: As one of the most iconic peaks in Colorado, Wilson Peak is famous not only for being visually impressive, but it is also the peak Adolf Coors chose to represent his beer in 1873 and is now present on all its labels. This is a Telluride gem that has a commanding presence over the Telluride valley below. 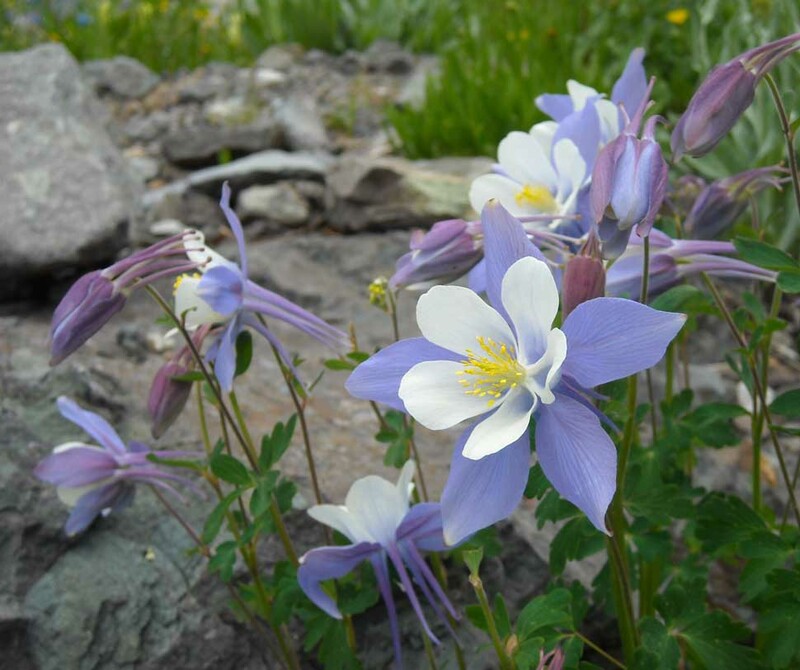 It is the 100th highest peak in the Colorado centennials. 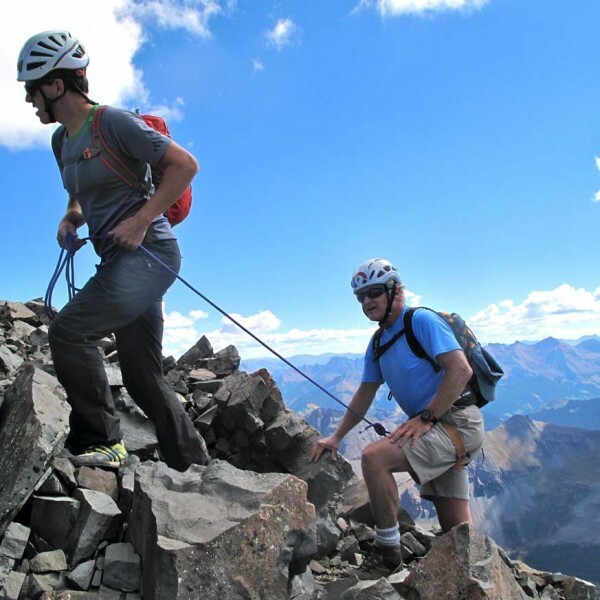 This peak ascent offers a good taste of low 5th class climbing, an exhilarating rappel off the summit block and great views of the Wilson Massif to the south and Mount Sneffels to the north. Like any big peak ascent our day will start early and begins on a well established trail weaving through the lower meadows before reaching timberline were we will put on helmets and harness’s and head into the alpine terrain above. The technical climbing happens high on the peak and continues to the summit block offering amazing exposure and great rock when the climbing gets steeper. 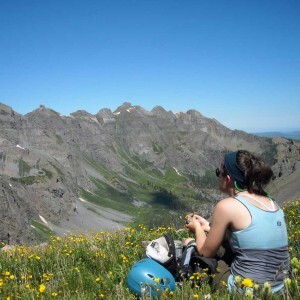 After taking in the view, we will head down via a rappel station perched atop the magnificent summit and continue back down into the meadows below. Though this trip has some technical climbing, it is a great option for a variety of ability levels. Lizard Head has the reputation of being one of Colorado’s hardest summits and reaching it involves 3-4 long pitches of technical climbing. The crux is below the actual summit and is rated 5.8, although that section is fairly short. Prospective Lizard Head summitters must have previous climbing experience. This route is a great next step after climbing Dallas Peak or after a day or two of rock climbing on the Pipeline or Ophir walls! Like our other peak ascents we will start early to get a jump on the day and head up a well established trail towards the towering summit of Lizard Head. After leaving the trail we will head up some 3rd class scrambling to the base of the SW Chimney route. After ascending the first long pitch we will do an easier traversing pitch to the base of the final pitch and technical crux of the route. After a bit of steep wide climbing the terrain eases to more moderate 5 fun climbing to the top and incredible views of surrounding peaks including Mount Wilson, El Diente and Wilson Peak to the west. After 2 rappels and some down climbing we will arrive back at the start of the route and head back down into the forest and back to Telluride. And many more… inquire for details! The following is a general list of required gear for day climbs in Colorado with Mountain Trip. Climbers joining us on multi-day ascents will receive a specific equipment list via email. Many of the items on the list need to fit you well in order for you to fully enjoy your experience on the trail. Please plan ahead with clothing and footwear purchased for your hike so you can be certain that your gear fits you well. Descending from the top of Wilson Peak is not the place to discover that your old rain coat is no longer waterproof, or that your boots give you blisters. • Mountain Trip reserves the right to cancel an excursion prior to the departure date for any reason, including weather or route conditions. In such an event, all monies collected by Mountain Trip from team members for that climb shall be promptly refunded. This is the extent of our financial liability. Enter the number of people you are registering. Select a trip start date (blue) on the calendar. Click on the blue box that appears below the calendar.